I try not to use cliches, but after just a few days at the beach, I need a holiday from my holiday. Unfortunately, I have a kid. So I’ll never get one. You lose a lot of things when you have kids. (Yes, bleeding hearts, you gain a lot too – like a new perspective and a bigger heart and tons cuts on your feet from stepping on LEGO pieces – but becoming a parent forces you to shed much of your old lifestyle to accommodate your new one.) Never is this more clear than when you take go on holiday with your offspring. What used to be equal parts bender and relaxation – a stretch of time devoted to drinking and napping, eating and swimming, staying up late and waking up late – becomes a test of endurance. A brutal battle to max out your stamina and maintain enough energy and enthusiasm to reap as much reward as possible, even as your energy and enthusiasm dwindles. That’s not to say it’s not fun. We had a blast going away with our son for the long weekend. 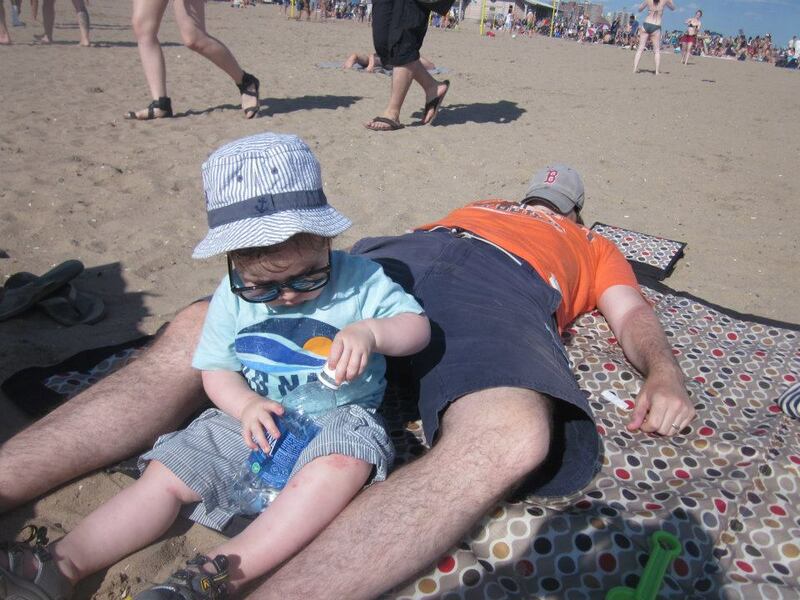 He had a great time playing in the sand with his honorary uncles, and the adults even managed to have a few pops and eat a few meals without a few meltdowns (he was seriously well-behaved most of the time). Overall, it was great success. But this morning, even after a decent night’s sleep in my own bed, I woke up feeling… what’s the opposite of refreshed? It’s not that having a toddler is physically exhausting, although it is. Running after him when he breaks loose in a store or a parking lot or on a beach; wrestling him down to brush his teeth so he doesn’t end up looking British or to apply sunscreen so he doesn’t end up looking British; carrying him to bed or to the bath or in and out of his car seat while he flails and kicks like a fish with limbs. All of that is definitely exhausting. But that’s not the real issue. And it’s not that having a toddler is mentally exhausting, although it is. Devising lists in your head every time you leave the house just to make sure he has his lovey and his milk and his snacks and some crayons and some diapers and some wipes and a stroller and the sunscreen and his toy phone and his coloring books; stressing out every time you think there might be egg or peanuts or gluten or glass in his food; worrying all night long that he’s being too quiet in bed or not quiet enough; gritting your teeth at a restaurant or at a store or on playdate when he starts to scream and throw a tantrum and people are watching you. All of that is definitely exhausting. But that’s not the real issue either. Of course, being exhausted is not just for parents. Once you hit a certain age, energy is just harder to come by; pretty much everyone I know is exhausted all the time. It’s just life. But as a parent, there is one primary reason I am always so tired: the lack of recovery time. One of the earliest pieces of advice I got when my wife was pregnant was to catch up on sleep before my kid was born. It’s both incredibly apt advice and terribly stupid advice. Stupid because there’s no way to “catch-up” on sleep before you lose it; you can’t bank sleep. And apt because once you have a kid, as in DAY ONE, the amount of sleep you’ll get for the rest of your life – on both a daily basis and in an accumulative “total sleep hours” one – begins to diminish and never stops. It’s like someone pokes a hole in your canteen and slowly all of it drains out. And there’s no getting it back. When you have kids, or even just one kid like I do, you don’t get a day off. You don’t have a chance to play catch-up. If you happen to stay up too late, or party too hard, or go out and get a little tipsy, you aren’t getting the extra sleep you need the next day. You’re not getting a chance to sleep-in until your hangover goes away or you get some energy back. You get up when your kid gets up and you follow him around doing everything he needs because you’re his slave and that’s your life now. The same thing happens when you’re sick. Your kid doesn’t care if you’re hugging the toilet or if you need your appendix out or if you have a headache. Your kid doesn’t even care if he’s the reason you have a headache (guess what? He is the reason.). So sure, going on holiday with kids is still fun; it’s just not much of a holiday anymore. Not like it was. Unless you have a nanny. In which case, I take back everything in this post and also I hate you. This post originally appeared at Dad And Buried.